(APN) ATLANTA — A 2.54 acre empty lot in Atlanta’s Kirkwood community at 145 Norwood Avenue is home to some of DeKalb County’s oldest and largest white oak trees, including one that is believed to be the oldest in the county, possibly the state. Now, the tree and its sister trees face a developers’ removal request, as advocates mobilize to preserve them. Most of the trees are over one hundred years old with some older and they measure from 36 inches to 59 inches in diameter. The lot has been purchased by Reid Knox Developers who plans to build eleven homes on the lot. “The only way to get that many homes crammed into that small of a lot is to cut down the trees and have a cul de sac down the middle of the property,” Stephanie Stuckey Benfield, Executive Director, GreenLaw, the attorney for the trees, told Atlanta Progressive News. Benfield recounted that at the Tree Commission Hearing on January 21, 2015, the developer said their development proposal would not be profitable if they do not fully develop the lot with eleven homes. However, the Tree Commission gave the trees a partial victory by asking the developer to come back in 120 days with a revised plan that was more environmentally sensitive and protective of the trees. One very large white oak is listed with Trees Atlanta’s Champion Trees database. It is the largest in the county, and possibly in the state, with almost a five feet diameter. Some estimates put the tree around 300 years old. To get on the database, a tree must represent some of the oldest, heartiest, and most beautiful trees in the county. Trees Atlanta’s objective is to locate, document and protect the finest trees in environmentally sensitive areas. 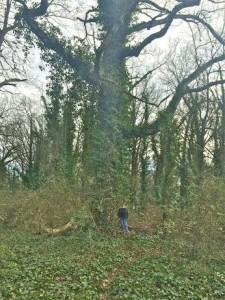 The largest and oldest white oak tree, the champion tree in question, is marked for removal with a big orange x on its almost 10 foot circumference. “It isn’t just this one beautiful old white oak tree, it’s an old growth stand of eight to ten healthy white oak trees,” Benfield said. Those trees have hundreds of years of life left to absorb the water, clean the air, house the birds, and provide shade for children to play under. A red shoulder hawk has been spotted and photographed on the property. Within the city limits of Atlanta, the red shouldered hawk is protected. Also a barred owl is believed to nest on the site, according to GreenLaw. GreenLaw hopes the subdivision lines can be redrawn so houses can be built to preserve some of the older trees. Developers “need to think outside of the box,” Neil Norton, an independent arborist with TreeInspection.com, told APN. “We need to develop in a different way and they want to do the same old thing that has been done for the last fifty years. The conservation subdivision easement allows them to build the homes closer together, higher, with shared common space and green space,” Norton told APN. “It’s actually cheaper for them to develop this way because you don’t need so much infrastructure, it’s better for the trees, the community will have access to green space, and they could still make their money,” Norton said. With Norton’s plan, eight homes could be built at 145 Norwood and still save most of the trees and have a green space in the back. The trees would continue to absorb the water; therefore, eliminating the need for a water retention pond that would take up the space of two homes, require more sewage infrastructure, and cost a lot of money. The current plan calls for a water retention pond in the back of the property because most of the trees will be cut down, and the land will be bulldozed with concrete everywhere; and this creates an expensive water drainage problem. Instead, under Norton’s plan, the water would be absorbed through the soil and there would not be a water problem. “It’s an antiquated way of dealing with water, which will destroy more trees and creates all this imperviousness,” Norton said. Other options are for the City of Atlanta, East Lake Foundation, or the Conservation Fund to purchase the property. Currently there are disputes on the size and age of the trees, and even which ones are marked for removal. Some trees are marked for removal at the site but not on the plan, while still others are left off the plan entirely. A lot of contradictory information and misinformation has confused the issue. GreenLaw will continue to fight to preserve the trees until an acceptable resolution is reached, Benfield said. RE: the oldest oak. Remember the empty lot along DeKalb AVe., where a fine oak stood, whose life advocates tried to save? Signs were posted, etc, to no avail. They cut it. Now, several years later, the lot is overgrown w brush, ugly, and no sign of development. The photo struck me in 2 ways: was that a tiny human standing at the foot of the tree?, and, is the tree being taken over by ivy?? Ivy kills trees! I would love to find out from Stephanie Stuckey who her client is (besides the trees). Who raised the flag on this and why? I bet a dollar to a donut that it was one of the property owners who back up to this. They don’t care about the tree or the darn hawk, I smell a rat! They just don’t want the area behind them developed, screw the trees they cut down to build their house, love the hypocrisy. This article makes it seem like it’s some urban wonderland, full of beautiful trees and rolling streams, happy animals frolicking in the midst, I had to laugh as I read this. That property has become an eyesore for the this community since the camp went away. It’s not full of wonderful trees and happy animals, it’s a dilapidated unkempt tract of land that would better serve this neighborhood as a development bringing more families into this great community. Just so I have this straight. You “love the hypocrisy” of the as-yet-to-be-proven-to-even-exist Greenlaw clients? I do back up to this lot. Development- when done correctly is not a bad thing. It will only help our property values so it’s a mixed bag here. And if you ever spent any time near the property you would see the owl and the hawk. It’s very nice. It would be a great refuge. There are lot of places like this around DeKalb County that started out as “unkempt” spaces that were made into nice green spaces. Why do developers have to clear cut ? If you are in Kirkwood I bet you have some nice trees in your neighbors yard that are not being taken down because the city arborist would not let them. I don’t understand why developers get the pass on this. Regardless of the intention of the news article, if this is the oldest tree in Dekalb, then something should be done to preserve it. It’s about location. There are so many other areas that could be developed. If a plan would allow this and some of the others to stay then it should be implemented. If the company is more about the bottom line then maybe they should consider space that is free of trees. Can we work around the tree? Can we call the development White Oak Lane… The lot is an eyesore other than the tree. I vote for 11 new families. I vote for a new tax base. I vote for people. I vote for our community expanding and becoming a viable new, safe, and family oriented place where people want to move to. I vote for our school systems. I vote for moving into the 21st century. In the 21st century, we’re aware of our worsening environment, air and water. We’re aware of our shrinking green infrastructure, at the expense of the grey. Plenty of room for people AND unique groves of irreplaceable trees in our urban areas. One mature tree can clean and recycle over 200 gallons of water a day. Speaking of eyesores, is there anything uglier than a retention pond? They said it was the oldest in the county. Atlanta comprises several counties. So how, again, was the claim inaccurate? I’m well aware there are numerous counties in Atlanta. The list did not break it out by counties. I was merely pointing out that if this isn’t the largest tree in Atlanta, then it couldn’t possibly be the largest tree in the state. We have old Oak Trees with limbs bigger than that tree… on Rainbow Drive…. Based on the Trees Atlanta Champion Tree list, it is NOT the oldest WHITE Oak. Heartening to know that people are speaking up and working for common sense solutions to preserve magnificent trees that have been alive for hundred(s) of years and may live for hundreds more. If these rare treasures aren’t worth saving, what in Atlanta is? Love the nature “is an eyesore” comments, and the hysterical assumptions against the neighbors. Regardless, the simple solution is for this attorney and the concerned residents to donate/ raise the money to compensate the owers and set aside the land as a pocket park. We live behind this lot. It’s a shame to take down all this natural habitat. There is also a hawk that lives in the acreage. It’s a lovely natural space. I had to put on brakes this morning not to hit a bunny rabbit hopping into the lot. We, as well in our own yard have a 250+/- year old white oak. It’s about 55″ in diameter. We have it checked every year by an arborist. It’s a shame to take trees down for “space” or because they are “old”. They have a quality of life too. I’m presently sitting in a house in the city of Tallahassee, Florida. What initially strikes one is the old world charm of this city. And how is that achieved? Through their fierce protection of their old trees. There are large live oaks draped with Spanish moss everywhere. Without them, it would be just another old town center and strip malls and endless suburban streets. They work around the trees. It’s good to see people in Atlanta, my home, working with a developer to find a middle ground. There is surely a way to beautify the property along with saving trees. What the article egregiously omits is that the developer in fact is saving MANY of the trees on the site … and is even planting 70 more trees. There are so many inaccuracies in this article that the editor of this publication should hire a fact checker. This includes the statement that the land contains trees up to 59 inches and that the tree commission required the developer to come back with alternate plans. The tree commission deferred ANY decision for 120 days and acknowledged that it did not have the power to force the developer to present any plans. Also, there is NO JAMMING OF 11 houses into the lot. There will be 10 houses in the lot, and an additional house built in between 2 existing houses. The 10 lots that will be on the now undeveloped land are equally spaced apart and are roughly the same size as EVERY other lot in the neighborhood. What is interesting is that the article suggests building the houses closer together to provide community space. So basically, the alternative would be to JAM 11 HOUSES SUPER CLOSE TOGETHER and remove each owner’s chance from having any private front or back yard of their own on which they could have their own trees to play under? Additionally, the hawk and owl were likely spotted in the area because the neighborhood has a specific Hawk park designated for these birds … and naturally they fly around the neighborhood. The development has been approved by both the Kirkwood Neighbor Organization and the City. This only became an issue because ONE of the neighbors to the land is upset that he will now have houses behind him … and he won’t have this land to trespass on anymore. Everyone else in Kirkwood recognizes that the developer did all he could to save AS MANY trees as possible while also providing addtional houses for the neighborhood that will bring new families and increased value to the entire community. This ONE neighbor is looking to block the development in its entirety … and has involved Green Law to help him acheive that goal … without considering what any of us other Kirkwood residents think or want for this land in the middle of our neighborhood. It's a shame...but we do (rightfully) enjoy our property rights in this country. If you like the big trees, try to buy the lots containing them yourself and see if you can get a nonprofit or government subdivision to pay you to keep it undeveloped. We can always dream. What do these developers, planning commissioners and county commissioners have against trees??? They will not be able to replace the advantage these senior trees have on our watershed, air quality or just the temperature of the surrounding neighborhood with a 20 ft. scrawny and ill-taken-care-of maple, or worse, collapsing & stinky pear tree. But the developers and commissioner are in it deep together, i.e. padding pockets and padding county coffers. In the Oak Grove area we have had numerous old-growth trees annihilated by the developers – it’s called progress – for the “professionals” that are too lazy to rake a leaf. Plus the trees might fall on their mansions!! Hey, they haven’t fallen in 100-200 yrs. The developers’ fines for removing more trees than is “code” is definitely not steep enough and is too easy for them to pay with their fat pockets. We have been trying to save a forest nearby at Briarlake Rd. but the owners want money (and lots of it), probably so they can move away to a place that has trees. To the ones that want this area fully developed: Do you just want your property values to increase? Would a greenspace/park increase your property values? No – a greenspace/park would not increase value especially since there is a very large and wonderful park already right across from the empty lot. What would be the point of a new park? Even a new park would require some of the trees to come down and the lot to be developed in a park like manner. The lot is not some pretty forest of trees. The majority of the land is simply unkempt foliage, not big oak trees. There is not a better area than this one to develop in order to add much needed houses to a growing neighborhood. Developers do not necessarily have anything against trees. People have to live and people need homes. And the number of people in the city is increasing daily – a testament to the wonderful aspects of the city itself. Should we abandon all efforts to provide people with new opportunities to live within the city? Should people be forced to live outside the city to prevent trees from being taken down? Such a solution sounds as silly as saying that all developers have something against trees. Dude, Kirkwood loves clear-cutting lots and putting up homes that look out of place. Always an interesting neighborhood to bike through. I’m city of Atlanta and have a giant white oak tree 12 feet from my house. People have told me I could probably lobby the city and pay to have it removed. But why? To save myself a couple dozen hours of yard work a year while contributing to the local heat-island? Clear-cutting is not progressive or smart urban growth. It only exacerbates erosion and runoff – which will certainly occur on neighboring properties if this development is built as requested. Developers will always claim that they can’t make a profit without clear-cutting. That just isn’t true and it never has been. Buckhead has an ordinance in place to protect its historic trees, as do many other municipalities in more progressive states. Mature trees add to the value of a property. Other Atlanta communities must begin to forge stronger tree ordinances. Replacing even a 100 year old tree with 5-7 smaller ones can not add the benefits that mature trees give to an area; lowering energy costs, lowering the heat index, providing wildlife habitats and protection from drainage and runoff issues. With the help of Dekalb county’s land use director, I saved my specimen water oak close to a county right of way from a developer who claimed she could tear it down to build a sewer line, then asked to buy it from me, then asked to buy my house. I refused on all counts. Because she cleared an acre that sits above my property and was forced to add a detention pond for runoff, I now get a large amount of runoff into my yard that never occured when the acreage was wooded. Trees do so much more for us than just look beautiful. Do they not get that the trees are a large part of what brings people to the community? That the trees, their uniqueness, not only drives economic development but has (or had) the potential to incresingly do so! That you can’t just replace a hundred years in an instant? It’s a real shame. The sense of what is important, what is lasting, what is beneficial is all wrong here. Those trees have lasted longer than the new construction ever will. Who needs trees? Trees impede PROGRESS! I say: CHOP ‘EM DOWN!!! !